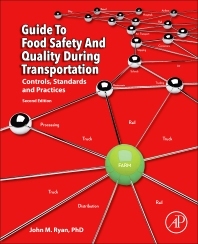 Guide to Food Safety and Quality during Transportation, Controls, Standards and Practice, Second Edition provides a solid foundation outlining logistics and delivery control solutions to protect the food transportation industry. Since its first publication, the U.S. FDA has finalized a number of Food Safety Modernization Act rules designed to improve the protection of the public from adulterants known to cause illness and death. Food shippers, carriers and receivers throughout the world are impacted as import controls have tightened. This book provides the information needed to comply with the Act’s requirements and tactics on how to achieve safety in the food supply chain. Filled with legal, liability and practical solutions, food transporters and buyers will be able to structure company-wide business practices as part of their overall food safety and quality agendas. For food safety and quality students, the book provides much needed insight into a critical, but overlooked, aspect of the food safety and food quality spectrums. This food transporter piece of the overall food safety and quality puzzle provides the linking mechanism needed to improve the supply chain communication and interdependence sought after by governmental and industry executives.